Get her an outfit she'll love! These long sleeve rompers by Truly Me are essential pieces to add to her Fall wardrobe! The IVORY MULTI romper is our best seller! It features a beautiful border print, trendy bell sleeves, and adorable ombre dip dye tassels. You can't go wrong with Amazon's #1 best selling romper for little girl's! The NAVY MULTI romper comes in a gorgeous Fall floral print. It includes functioning wooden buttons, and lattice trim along the trendy bell sleeves. This is the perfect go-to style for Back To School! The TAN MULTI romper is a classical addition to her closet. This romper has a bohemian vibe with a minimalistic, yet charming print in seasonal neutral tones. Have her pair it with a floppy hat or western style boots! The BERRY MULTI romper is a cute and easy Fall style. It comes in a fun paisley print, where neutral navy blues meet vibrant shades of berry. She can rock this any day of the week at school! The BLACK MULTI romper is a timeless style upgraded with a stunning embroidery feature. 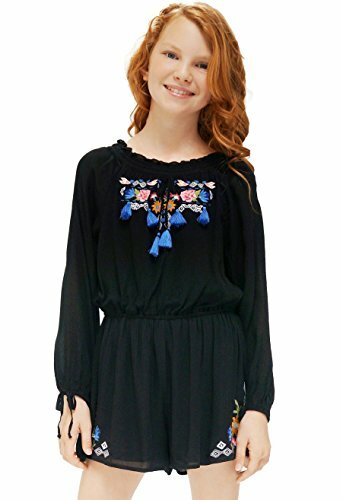 This romper comes in all black, but includes pops of color at the neckline and short hems. The embroidery is made up of both florals and geometric shapes. The vivid blue tassels only help to add to its appeal. Let your little girl flaunt her style in this lovely romper! The BLUE MULTI romper is simply gorgeous! It comes in a dazzling geometric print and matching trim. There is also an undershirt included. Let your little one shine in this lively romper! The IVORY romper is a soft and romantic style made for your little sweetheart. The floral print comes in a subtle rosy color palette and there is a unique border print running down the sides and sleeve hems. Get this one for your little daydreamer! The PINK MULTI romper is colorful and fun, yet extremely feminine. The colors are vivacious and the florals are cheerful. Perfect for a sunny school day! Perfect Big Girl Tween Style for Casual or Formal Wear!